Review: Penny enjoys a small amount of freedom when she gets to take her doll, Rose, on a walk. She encounters a beautiful blue marble laying in the grass by Mrs. Goodwin’s house and decides to take it home. Soon, Penny starts to regret her decision. She has an inkling that it maybe wasn’t the right decision to take something that doesn’t belong to her and was located on someone else’s property. Penny fills uneasy, but she never tells her parents about her decision to take the marble. This is what I love so much about this book. 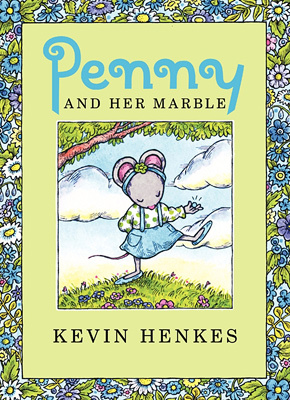 Penny makes the choice to return the marble completely on her own, without an adult stepping in to tell her what is right or wrong. Henkes is acknowledging that children have a developing sense of ethics and can use those instincts to make good choices. She learns that open conversations are valuable to clearing up a misunderstanding, and she moseys on to have a great day, feeling much better about herself. Henkes is teaching ethics without being didactic. It’s a simple story, but the simplicity is what is beautiful about it. This entry was posted in Picture Books, Reviews and tagged Ethics, Kevin Henkes, Picture Books. Bookmark the permalink.